Irvine, CA – Toshiba Imaging Systems Division, the global leader in high definition (HD) camera technology and 3CCD industrial and scientific cameras, announces a price breakthrough representing a 20 % (twenty percent) price reduction on five of their recently introduced, high-definition CMOS cameras. According to Vince Giovinco, National Sales Manager of Toshiba Imaging Systems Division, "Due to higher than expected sales volume, combined with our company's commitment to innovative manufacturing techniques, we are able to offer this substantial price reduction on five of our most popular HD CMOS camera models. We are delighted to pass along these savings to our customers." Toshiba's one-piece IK-HR1S is an ultra-compact (1.75 in. x 1.75 in. x 3 in. 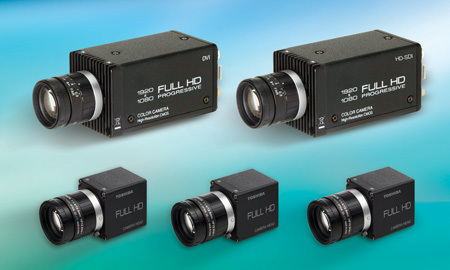 ), HD-SDI camera that has selectable outputs between 1080i and 720p at 50 Hz or 60 Hz video. The 2.1 mega pixel CMOS sensor is versatile and easy to integrate with the C-mount lens feature. The IK-HR1D camera model features full, high-definition resolution at 1920 x 1080 pixels at 60 frames per second. With selectable outputs of 1080i or 1080p, this small, one-piece CMOS HD camera has both digital DVI output and an analog 8-bit RGB interface. Toshiba's third HD CMOS camera, the IK-HR1H, features an ultra small remote head (only 1.18 in. x 1.37 in. x 1.41 in.) housing. Two versions of this tiny, lightweight camera are also available for added flexibility in applications where space is limited. The first is the IK-HR1CD with the 8-bit (RGB) DVI-I connector and DVI-I with selectable outputs of 720p at 60 fps, 1080i at 30 fps, and 1080p at 60 fps. The IK-HR1CS version of the remote head CMOS camera offers HD-SDI version with 720p at 60 fps and 1080i at 30 fps. All five models are ideally designed for broadcasting applications, such as entertainment, sports, reality TV, and 3D production. The new, affordable CMOS high definition models are also in use in aviation, microscopy, defense, diagnostics, and life sciences. Toshiba Imaging Systems Division (Irvine, CA) is the premier supplier of high quality video cameras for machine vision, R&D and scientific applications. Advanced video imaging technology and high resolution cameras such as Toshiba's 3CCD color cameras and their remote head camera family has earned Toshiba America's Imaging Systems Division the distinctive reputation for offering the most advanced imaging solutions to the industrial and scientific communities.